At Wadsworth Osteopaths we see patients who have injured their backs every day and probably more than half of these are pelvic joint injuries. The pelvis lies between the hips and the bottom of the spine and is made up of the triangular sacrum in the middle with the last lumbar vertebra sitting on top and the tail bone or coccyx hanging from the bottom of the sacrum. 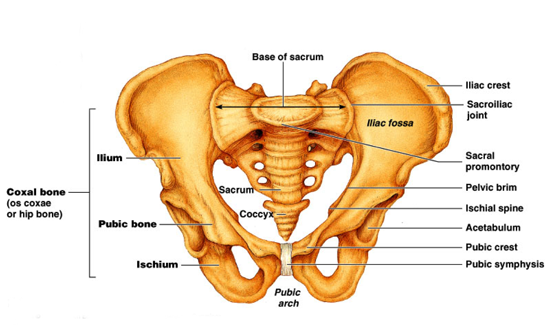 The broad bones of the pelvis are attached to the sacrum on either side by the sacro-iliac joints. They are joined to each other at the front by the pubic symphysis and the deep ball and socket joints of the hips are located on either side. Q. Which parts of the pelvis can be strained or injured? A. The sacro-iliac joint is the one which is most commonly strained. The sacro-iliac joints are flat with ridged surfaces angled obliquely and supported by tough ligaments. The SI ligaments can be strained or overstretched and this usually occurs when we bend forwards with a twist. The symphysis pubis at the front of the pelvis can also be strained during pregnancy when hormones soften the supporting soft tissues that hold the joint together. Otherwise it is less common to strain the pubic symphysis. Q. How can I tell if I have strained one of my pelvic joints? A. Pain. Pain is the most common symptom. For SI strains the pain is usually felt at the bottom of the back to one side or the other. The sacro-iliac joint can refer pain into the groin on the same side and in some men also into the testicle. • An arthritic hip or knee where the articular cartilage has worn down on one side can also give the effect of one leg being longer than the other. Difficulty straightening up from a bent position: When the sacro-iliac joints have been strained it is common for patients to mention that they can bend forward but coming up straight again or bending backwards is quite painful. Pubic Symphysis: If the symphysis joint has been strained there will usually be pain at the front of the pelvis a couple of inches below the belly button. Also walking can be very painful. Coccyx: Coccyx pain is usually felt over the coccyx. Be aware that coccyx pain does not always come from the coccyx - for example a strain of the bottom lumbar joint can send referred pain to the coccyx. Hips: Hip pain can be felt at the side, at the widest part of the hip where the knobble of the greater trochanter can be felt just under the skin. It can also be experienced as referred pain in the groin, front of the thigh and or front of the knee. Hip strains are also usually associated with pain on movement ‘It is painful reach my foot and I am struggling to put my socks on’. Q. What can I do if I think I have strained one of my pelvic joints? A. For pelvic joint strains the advice is to rest (a day or 2 in bed if it is really severe) otherwise it is best to keep it gently moving – sit a bit, move a bit, stand a bit, move a bit. Use heat and ice as needed. Heat for muscle spasm, ice for inflammation. Use medication - pain killers and anti-inflammatory drugs can help. Get some advice. Your GP can advise and help with medication. 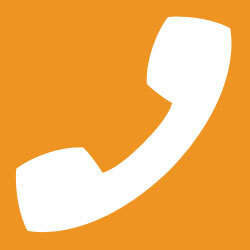 We are happy to talk to patients on the phone and advise on home management. If your pain is persisting we would need to do a proper examination to find out what has been damaged and work out a management and treatment plan. Treatment can involve a range of techniques including traction (stretching), soft tissue massage to relax muscles, passive joint stretching, manipulation (or High Velocity Thrust). Corrective positional manipulation is often helpful. Other techniques include muscle energy and cranial techniques which can be used in certain circumstances. Home management, work management and exercise advice will be given when the time is right. Q. What else can go wrong? Fractures: Fractures to the hips and pelvis are normally associated with serious trauma and in most cases you will be looked after at A&E. Pelvic Organs: The bladder, uterus, bowel and other pelvic organs can all give pain in the back, or groin (as with pelvic joint strains) so it is important to bear these in mind. When we see patients with a fresh injury we will always ask questions to check the organs are working correctly and if there is any suspicion of a problem which is not from the muscles and joints we will ask patients to speak to their GP. See below for further information about the pelvic organs. Hernias: A hernia occurs most commonly where there is a weakness in the muscles of the abdomen, this can be caused by physical strain (eg heavy lifting) or from excessive straining or at sights of old wounds (eg surgical scars.) So, while a hernia may give pain in the groin, like referred pain from the sacro-iliac joint, there will usually also be a lump. If present this will also need to be discussed with your doctor.